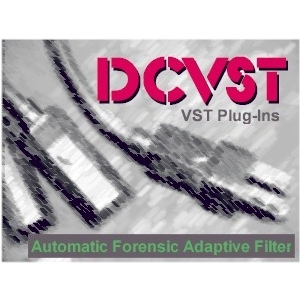 DCVST AFDF Automatic Forensics Adaptive Filter - Tracer Technologies Inc. This plug in is based on the AFDF Automatic Forensic Adaptive Filter that is found in the Continuous Noise Filter of our popular DC LIVE/Forensics software product. It is designed to help you quickly and easily dig deeply into an audio file filled with noise and pull out a single voice or conversation. Because it is an ?Adaptive? filter, it is constantly changing during operation and can adjust on the fly to noisy environments. Because this filter is almost completely automatic, little or no training is required to begin getting excellent results the moment you install it. The Forensics Adaptive Frequency Domain Filter (AFDF) is a variation on a standard Adaptive filter. The primary difference is that the Forensics AFDF is optimized for Forensics oriented files and not ?High Fidelity? files. It has a faster response time and a narrower effective bandwidth while producing higher levels of noise reduction at the expense of potentially producing higher levels of digital artifacts.